We travel up the River Soshenstar toward Camp Righteous, dealing with crocodiles, waterfalls, and dinosaurs. Chult is a dangerous place, which in D&D terms means a healthy dose of random encounters while traveling in the jungle. Traveling via canoes down a river allows for faster travel, and I house ruled that the party can’t get lost on the river. But the rivers aren’t entirely safe either, as the party has to deal with crocodiles, waterfalls, and dinosaurs. 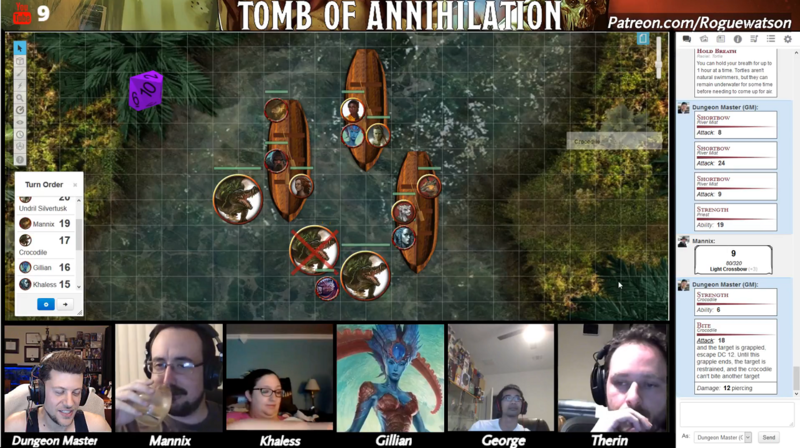 Our heroes and their bulging entourage of NPCs (that’s Undril, Inete, Azaka, and the two Tabaxi, River and Flask) traveled on their three canoes toward Camp Righteous. We had squeezed in the first day of travel during last week’s session, featuring a fight against some plesiosaurus at the mouth of the river. Day 2 in the jungle was a rare moment of respite. No encounters at all! Day 3 featured a trio of crocodiles ready to ambush the canoes. They can capsize the canoes with an Athletics Check, and I rolled decently on their initiative. None of them were able to get the job done, however. On the flip side, the party isn’t great at ranged attacks (unlike our Storm King’s Thunder party!). Trying to fight while in canoes proved challenging – until George leapt into the water. That tactic worked during the last fight against the plesiosaurus, and it worked again here. Though also like last the last river fight he took some nasty damage when a croc turned and clamped down. Khaless followed suit, leaping on top of the croc and plunging a dagger into its head, stunning the croc and freeing George. The two of them formed an effective fighting unit, which would repeat during the next encounter. On Day 4 they came across a waterfall. They were moving up river so they were at the bottom of a nearly vertical wall of water, forcing them to portage the canoes on land. As they trudged through the jungle carrying the canoes, a boar ran past them, followed by several deinonychus, large raptors who were the real inspiration behind the infamous velociraptors in the Jurassic Park series. The dinosaurs stopped to engage the vulnerable party. Therin used Speak with Animals to try and reason with them. I like playing up the fact that yes, you can speak with them, but they still have the intelligence of a beast. They are only interested in things like mating, food, hunting, and survival. Therin wasn’t able to convince them to completely back off – though the raptors decided to leave him alone in the opening salvo, as well as let one of their own continue to hunt the boar. I had to pull off the classic Clever Girl maneuver and have several more dinosaurs appear from the dense foliage of the jungle. With that tactic, rolling very poorly on initiative actually worked in my favor (yeah, let’s go with that). I didn’t have a hard rule involving the canoes but was hoping my players would think outside the box. Khaless suggested the tabaxi hide inside theirs while she sprinted ahead, and they immediately acquiesced. Azaka threw hers at a dinosaur, unsuccessfully, before going sword-to-claw with the leader. After a round of being attacked, Undril opted to throw their canoe on top of an injured dinosaur, trapping it. Therin is very interested in his Gotta Catch ‘Em All desire to gain more Wild Shape forms, and as DM I definitely want to give him those opportunities, and trapping one alive proved the perfect opportunity. George and Khaless launched into a trio of dinosaurs, blades whirling, while Therin morphed into his bear form. He does a solid amount of damage, but more importantly has around 30 hit points of bear-ness, acting as a critical off-tank for the party and absorbing some nasty blows. 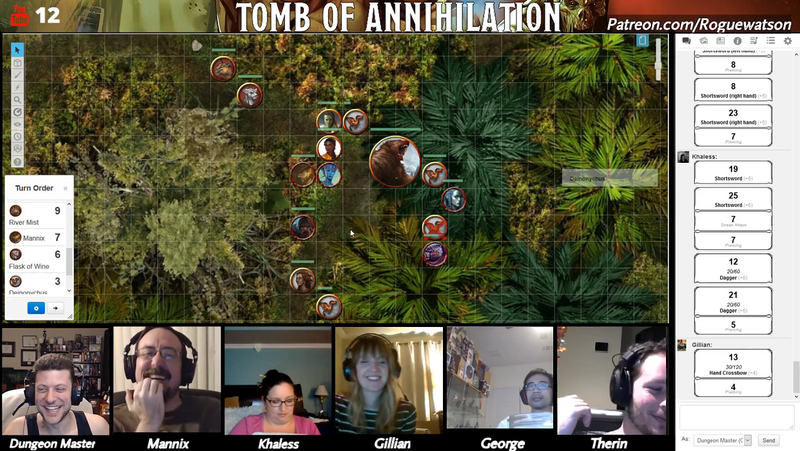 Therin realized about halfway through the session that Wild Shape comes back on a Short Rest, letting him use it during most encounters in the jungle, despite our house rule of no automatic Long Rests in the jungle. Morph away! Day 5 brought the party back to the river with heavy rainfall, cutting into their visibility. No day encounters, but I teasingly ended the session just as the party camped for the night. The days can be dangerous in the jungle, but the nights are long and full of terror.